Nothing says a guy’s afternoon like NFL football, greasy food, dirty dishes in the sink and…watermelon beer? My first experience with 21st Amendment’s ‘fruity’ brew, was over Labor Day weekend. It was an intriguing find at a Grand Ave. liquor store, stashed in the largest walk-in cooler I’d ever seen. Its in-your-face name and my affinity for interesting (and fruity, I confess) beers forced me to grab a sixer off the chilled shelf. It pours in an essentially typical wheat beer way. The head is thinner, less buoyant and a bit impatient, leaving my glass before my introductory sip. The body is opaque, orangy-yellow and the head a very slight rim around the edge of the top. The scent is more citrus than watermelon and faintly sour, the way many average wheats seem. While I admit I have a higher tolerance for fruit in my beer than some beer ‘geeks,’ I try to stay objective in my review of this one. 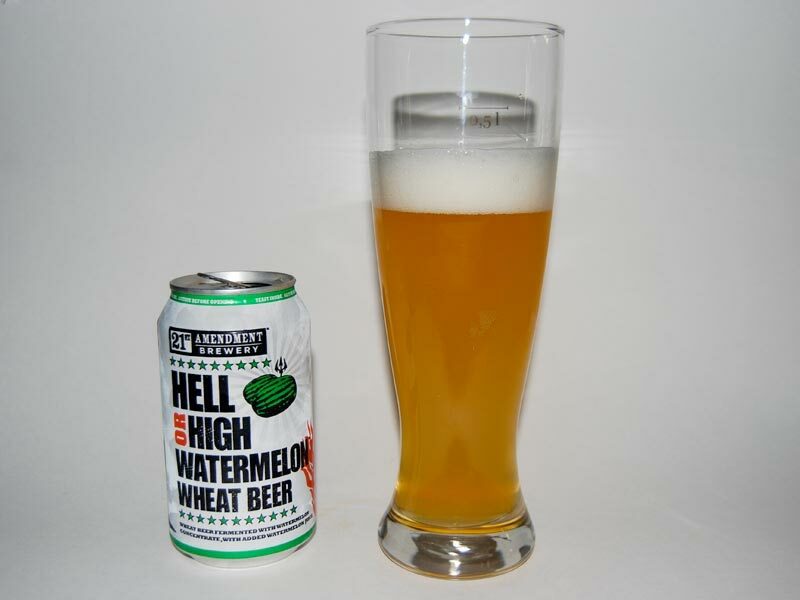 It is refreshing, the watermelon mostly on the finish, in a quiet, respectful sort of way. It is the most exciting part of the brew, surely, but isn’t overwhelming or obnoxious. The wheat itself is good, going down very easily and lacking any pungent, funky aftertaste of a less well-crafted beer. If you hate orange rinds floating on the head of your brew or lemons setting on the rim of your chilled glass, you may want to leave this one where it lies. However, if, like me, every now and again you feel like a lighter beer with some character, I’d definitely say give it a try. Note: All three of the three women surveyed in the process of sampling this beer, enjoyed it. Good choice for the ladies…and me, I guess. Whatever.